Rajon Rondo is in the midst of something special. The Celtics’ point guard has recorded 37 straight games with at least 10 assists; he is currently tied with John Stockton for second place all-time with the streak. Rondo can take over sole control of second place with 10 or more assists against Brooklyn at the TD Garden on Wednesday. Magic Johnson holds the record for the longest streak with 10 or more assists at 46 games. For Rondo to break that mark, it would have to come on Dec. 18 against the Bulls in Chicago. The former UK point guard is leading the NBA in assists per game right now, averaging 13.7 a game. The single season record is held by Stockton, who averaged 14.5 assists a game in the 1989-1990 season. But, the important thing to realize here is just how much Rondo means to the Celtics. Without him, the Celtics would be lost. By the most basic definition of it, Rajon Rondo is the most valuable player in the NBA. 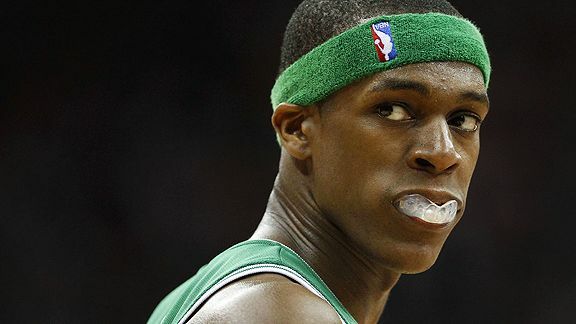 If Rondo were to suffer a long-term injury, it would be the most devastating loss to a team in the NBA. If LeBron were to go down for the Heat, Wade and Bosh could step up and perform. If Durant were to get hurt, Westbrook, Ibaka, and Martin could pull the Thunder along. The Lakers could even find a way to be relevant without Kobe, especially with a healthy Nash. But, if Rondo were to get injured, the Celtics would be done. They don’t have a true backup point guard. They are also simply too old, Paul Pierce and Kevin Garnett are still very good players, but a lot of that has to do with Rondo now. The point guard has expanded his game, his midrange jumper is blossoming and his basketball IQ is skyrocketing. Rondo has seven 20-plus assist games on his resume; pair that ability with his leadership, knowledge and developing jumper, and you have an MVP candidate. Recently, when asked if Rondo reminds him of anyone else, Celtics head coach Doc Rivers mentioned Jason Kidd, Magic Johnson and Stockton. That’s extremely high praise. Those are three faces on the Mount Rushmore of point guards. I’m not saying Rondo is definitely going to win the MVP award this season, but I am saying that he is the most valuable player to his team in the NBA. He’s averaging a double-double right now, with two steals a game on the side. Jason Terry, the newly acquired Celtic, is already campaigning for Rondo to be MVP. And he knows what it’s like to play with one, he was with Dirk Nowitzki in Dallas during his 2006-2007 MVP season. In game two of last year’s Eastern Conference Finals, Rondo appeared to be the best player in the league, while playing against the league’s actual best player. Against the Miami Heat and LeBron in game two, Rondo scored 44 points, had 10 assists, ripped down eight rebounds, and snagged three steals. The Celtics lost, but his performance was amazing. Rondo has the skills to win the MVP award, but Boston needs to win more frequently for that to happen. The Celtics are only 8-6 right now, that winning percentage isn’t going to cut it. Similarly to his three-point shot’s chance of going in, Rondo’s chances at winning MVP are slim. However, he did go two for two from beyond the arc in that legendary game two against Miami. And as his legendary teammate Kevin Garnett once proclaimed to the world, anything is possible. So, don’t count Rondo out in the MVP race. I called him the best point guard in the League last year and was immediately thrown into the Lion’s Den…maybe a few records could at least garner my comment some respect? If we’re talking pure point guards, I’d have to agree with you. I could definitely see an argument for him being the best PG. I like Rondo and agree with this. Deron Williams has to mentioned though. I feel like Williams can score and even dish it out, too. What he scored 16 and had 14 ast. against the Knicks two nights ago? I don’t know how I would rate my top 5 or so point guards right now. Maybe Rondo, Williams, Paul, Westbrook and Parker? Then Jennings, Nash, Irving…who knows! PAPI!!! Yeah the top 5 is always so hard to do. But I agree with you on Deron, he’s right up there with Rondo as far as value to his team in concerned.